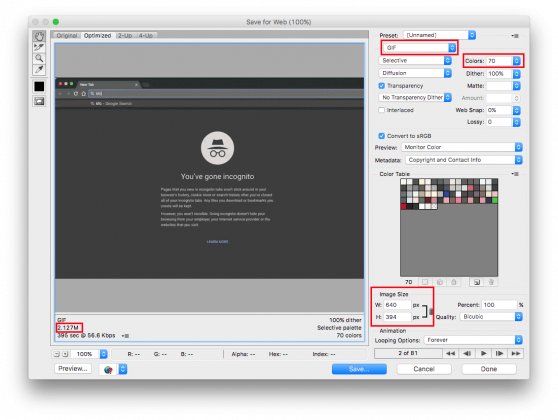 Recording a gif on OSX is fairly easy but you’ll need a few tools to make it happen – especially if you want a nice, small filesize for online viewing. You can use anything for this – I was recording a window on my screen so I used Screenium but Quicktime works fine. The output was a 15 second 1.1MB MOV file of resolution 1184×738. I saved the file as demo.mov on my desktop. From our PNG slideshow we can generate a (huge) gif. Don’t worry, we’ll fix the filesize later. Drag your new gif into Photoshop. Here you can make any changes such as removing frames. Turning on Window – Timeline will help here. Tweak your Image Size and Colors values until you get the filesize you want (shown at bottom left). You can preview the GIF in realtime using the media buttons at the bottom right. If the filesize is still too large, return to step 2 and lower your gifs FPS by lowering the r value. Thanks to tskaggs for his super helpful post on how to do this.